Rachel Strohm asks for "Development Wishlists". Here is mine. Take migration for development seriously. Imagine what this chart would look like with liberalised migration policies for unskilled workers from poor countries to move to rich countries. I have to say that I never thought much about migration as an aspect of development before seeing your recent writing on it, but you've very much convinced me that migration policy needs a larger place in discussions of what development should look like. 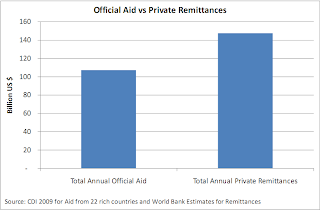 It's amazing, and sad, how these huge flows of remittances are invisible to many dev't people (myself previously included) just because they're not being directly provided by the West. What does corruption have to do with development? Does the Guardian care about Development?